★ ASIAN SIZE---The size photo in the left is RUN SMALL,please order one or two size up if needed,if have any confuses please feel free to contact with us. ★ ITEM MATERIAL---This thobe is made of 95% cotton +5% ployster,which is very soft and friendly to skin, wrinkle free,breathable,sweat absorption,anti sensitive. 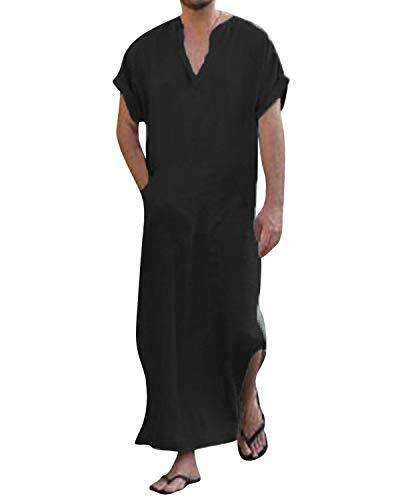 ★ FEATURES---Deep V neck, long robes, short sleeve, both side with pockets, side split, solid color. ★ OCCASION---This thobe is suitable for daily life,business,meeting,traveling and so on. ★ KINDlY REMINDER---Hand wash in low temperature,it's better to hang up rather than fold.Do not bleach, dry clean or tumble dry,low iron if necessary.